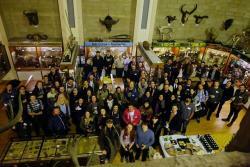 Delegates at the recent successful Venom Day Toxin enthusiasts from around the globe gathered in North Wales for an annual event organised by Bangor University students. Organised by students from the university’s Herpetological Society, and supported by the British Herpetological Society (BHS) and the University of Wolverhampton, the event was celebrating its ninth year of running after being founded by former Bangor student, Dr Simon Maddock. Speakers from around the world at this year’s meeting included World Health Organisation representative and Global Snakebite Initiative director, Dr David Williams, and Natural History Museum researcher, Dr Ronald Jenner. Bangor University lecturers, Dr Wolfgang Wüster and Dr John Mulley of the School of Natural Sciences also spoke at the conference. Throughout the conference there was a poster session promoting ongoing research, a series of stalls and a signing of the renowned herpetologist and TV personality, Mark O’Shea’s new book ‘Snakes of the World’. Rhiannon Williams, chair of Bangor’s Herpetological Society, said: “It’s amazing that so many people come to Venom Day every year. “This type of event gives us a chance to highlight the work being done in Bangor and demonstrates just how proactive and keen our students are,” Dr Mulley added. A raffle on the day in aid of the Global Snakebite Initiative raised £350. Bangor University is the only university in the UK, which offers a degree in Zoology with Herpetology.